These are listed in alphabetical order. There is no significance beyond that. The Chai symbol is commonly seen on necklaces and other jewelry and ornaments. The Hebrew word Chai (living/life) is made up of the two Hebrew letters Cheit and Yod. Some say it refers to the Living God; others say it reflects Judaism's focus on the importance of life and commitment to its continuance. Whatever the reason, the concept of Chai is vitally important in Jewish culture. The typical Jewish toast is L'Chaim (to life). Charitable gifts are routinely given in multiples of 18 (the numeric value of the word Chai). The hamesh (or hamsa) hand is a popular Jewish image but no one seems to know why! 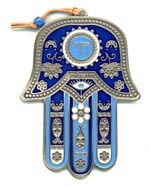 The inverted hand (thumb and pinky pointing outward) is common throughout Middle Eastern culture and is often depicted on jewelry. It does not appear to have any definitive biblical nor Jewish origin. Some use it to ward off the evil eye and/or evil spirits (much as Catholics use the sign of the cross), others use it as a good luck charm. Its origins reside within the fog of antiquity. Kappa (kippot plural) is the correct Hebrew term for the skullcap worn by Jews (primarily by male Jews although some women wear them as well). It is properly pronounced as "key-pah." Yarmulke (commonly but incorrectly pronounced as "yammica") is a Yiddish word. It comes from either the Tartar word for "skullcap" (according to The Joys of Yiddish) or from the Aramaic word yerai malka meaning "fear of" or "respect for the King" (which certainly fits the Jewish intention of the word and hat. The "Shield of David" or as it is more commonly known, the Star of David is a another key symbol of the Jewish people and our undying Hope (HaTikvah) of the coming Moshiach who will one day occupy the Throne of David in Jerusalem and liberate the world. 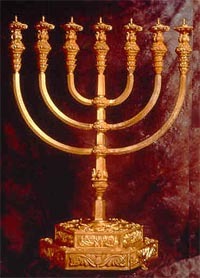 Menorahs are seven-branched candelabrum such as those once used in the Temple. The menorah is a key symbol of People Israel and our God-ordained mission to be "a light unto the nations." (Isaiah 42:6, Zechariah 4:1-6). 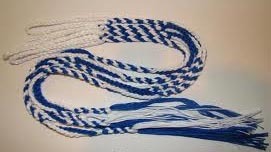 Also used are nine branched chanukiah used on Chanukah. Mezuzot are the 'kappas our homes wear'. It is a mitzvah (command) of Torah (and part of the the Shema) to have Mezuzot on our doorposts as a constant reminder of God's presence in our midst: The Shema is hand written by specially skilled Jewish artisans on a small piece of paper within the mezuzah tube or cover acknowledging that there is but One God and that we choose to serve Him and are chosen by Him for this service. If the mezuzah does not contain the specially prepared Shema is does not satisfy the requirements of the mitzvah. 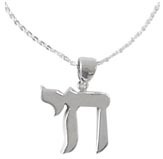 Mezuzot should never be confused with superstition or good luck charms. They are biblically commanded public declarations of the Oneness of HaShem. The case and scroll must be affixed at an angle to the right side doorpost as you enter the building or room according to standard halacha. When entering a building that has a mezuzah one should touch it and kiss ones finger, acknowledging one is entering a place dedicated to HaShem. As the text says, it is also good to place mezuzah on one gate posts etc. although the main entrance to the home is considered the most important. Religious Jews usually have Mezuzot on each door post within their homes (other than bathrooms and small closets). It is proper to remove a mezuzah when you move. In fact, it is usually recommended unless other Jews are moving in. If you leave it in place, the subsequent owner may treat it with disrespect which would be a grave offense which we would not wish to cause them by our negligence. 7 and you are to teach them carefully to your children. You are to talk about them when you sit at home, when you are traveling on the road, when you lie down and when you get up. 9 and write them on the door-frames of your house and on your gates. This command is observed by "laying tefillin." This means to bind the Torah passages to our arms and foreheads with leather straps and pouches containing scrolls of Torah passages. As with the mezuzah, the point is to remind us of HaShem's blessings and mitzvah and His Ruach (Spirit) in our daily lives. This understanding is contained within the word itself: "Tefillin" is etymologically related to the word "tefilah" (prayer) and the root Pe-Lamed-Lamed (judgment). Referring to this as tefillin is therefore preferable to the word "phylactery" which means "amulet" and misses the whole point. 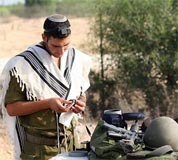 Laying Tefillin is a righteous mitzvot. The details of its observance (the leather straps etc) are revealed in the Oral Traditions but as with the Mezuzah the command itself is in the Written Torah. Numbers 15:38 "Speak to the people of Isra'el, instructing them to make, through all their generations, tzitziyot on the corners of their garments, and to put with the tzitzit on each corner a blue thread. 40 but it will help you remember and obey all my mitzvot and be holy for your God. Wearing tallit gadol: This is the traditional fringed Jewish prayer shawl. Tallit gadol (large shawl) is only worn during prayer and worship. Wearing tallit katan: This is a fringed smock style undergarment (although some Orthodox wear it as an outer garment). It should be worn during daylight hours by Torah observant male Jews. Some rabbis feel the command to wear tzitziyot does not apply after sunset while others wear it constantly. It can not be worn too often. Women are not required to observe time based mitzvot. For this reason some Orthodox oppose women wearing tallit (whether gadol or katan) and tefillin. There is a growing trend of acceptance of women wearing therm among the non-Orthodox sects and groups like the Women of the Wall are gradually moving the Orthodox world towards acceptance. Most tzitziyot today are all white and contain no blue threads. This is because the source of the techeilet (an aquatic creature used to make the dye) has been lost. Orthodox rabbis felt it better to not use the color than to risk violating the strict details of the commandment. Attempts to identify this creature and resume production have been underway for some time with debatable results. For more on this see this article by the Orthodox Union. Karaite Jews believe it is the color that matters, not its source and so their tzittzit have a blue that closely approximates the sky blue/turquoise techeilet.